Ninety percent of the energy used by an incandescent bulb is wasted, while only 10 percent is converted into light according to EnergySavers.gov. 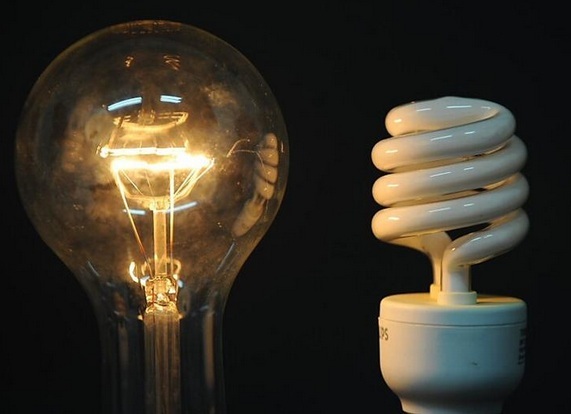 The new age light bulbs save energy by turning much more electricity into light. The engineering behind the manufacturing make it possible. The Natural Resource Defense Council says by 2020 the law will reduce energy costs by $100 to $200 per household each year. That is equivalent to shutting down 20+ power plants across the world. Money-saving options such as energy-saving incandescent, CFL, and LED light bulbs are available now. If you want to buy high-quality bulbs, choose bulbs that have earned more ENERGY STAR rating. Various ways to reduce home lighting costs are mentioned below, a few of them I am sure you can make use of at your home. Govt. Agency, energy saver guides that if you are a fluorescent bulb user, and you are going to be out for less than 15 mins, do not turn off the light. On the other hand if you are incandescent light bulb user, you may need turn off the light if you going to be out for more than 5 minutes. This is because each time you turn on and off lights, its operating life reduces. Do not keep the lights turned on in areas where you will only rarely visit. For example, wash rooms, patio, etc. As soon as you are done with using the room/space you should turn off the switch. Traditional incandescent lights are not energy-efficient and they only last about 750 to 1,000 hours in normal use. You can replace these bulbs with three energy-efficient choices: energy-saving incandescent bulbs; CFLs; and LEDs (light emitting diodes). I personally found LEDs are too costly for my taste. Although our living room has a couple of them and they look lovely! According to experts energy-efficient lights will save 25 percent compared with traditional incandescent bulbs. We generally keep them off unless we are expecting guests or having party at our home. You can also go for solar-powered lights. You just need to pay for the equipment cost, they don’t cost a penny to keep on going. They use solar power and charge during the day to glow the night long. Also If you absolutely want to have outdoor lighting use them with dimmer switches. Dimmer switches usually reduces the wattage requirement. Light enhances our mood. Lighting at our home is an integral part of over all home decor. There are plans that require lesser energy usage. Use stuff that reflect light and multiplies the effect. Glass and chandeliers are fine example of this decor. Now a days even chandeliers come with energy-efficient fixtures and bulbs. Readers, do you use other methods of reducing cost of lighting? Do you want to share your experience? Outdoor lights are a real big waste of money. I’ve been guilty of that for a long time. I just recently turned the stupid things off to save a few bucks on the electric bill.